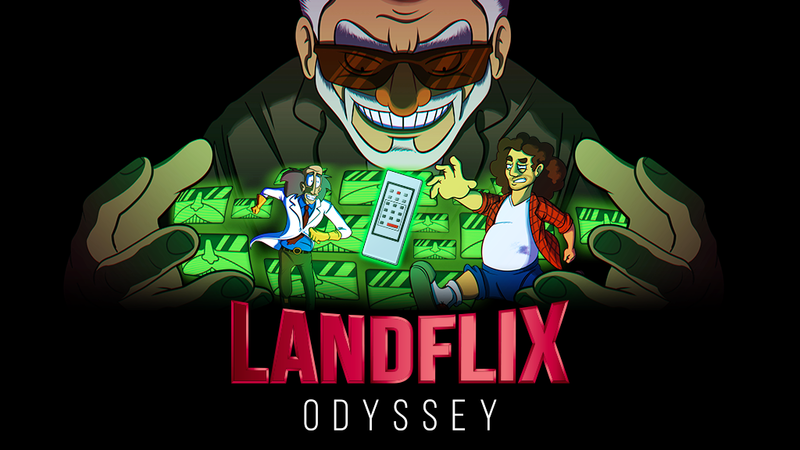 Landflix Odyssey is a 2D Platformer that mixes many gameplay elements from various genres. Play as Larry, a lazy binge watcher who ends up in a dimension that’s based upon his favorite Landflix (a video-on-demand parody) TV shows. Make him travel through many shows, gathering powers based on their lore, while helping famous characters and ultimately face an evil genius trying to conquer the world. Help him gather blueprints for his scientist relative, Uncle Doc, to power up said skills. - 5 worlds based on famous tv shows. - Use 5 powers based on said shows plus Larry’s signature move, his huge burp. - Power up your skills to increase your chance of saving the world. - Defeat or avoid The CEO’s minions and other evil creatures trying to get the best of you. - Fight 5 bosses and 5 minibosses based on your favourite antagonists. As you binge watch like usual, you unexpectedly discover the existence of a parallel fictional dimension inside Landflix through the use of nuclear batteries and a normal remote controller. As you set foot in Landflix’s home you meet Uncle Doc, a scientific genius who had recently disappeared. Before you can understand what’s going on, a small robot appears. He has a small screen on his body that displays an old man’s face. He’s Landflix’s evil CEO, who sent his minion after you to steal the nuclear batteries in an attempt to escape Landflix and conquer the world with his army of fictional characters. As you fight over possession of the remote, 5 of the 6 batteries fly out of the remote and end up in different TV shows, and the robot retreats. Finally you have time to try and understand what’s happening. Apparently the CEO was once your uncle’s coworker, but as his evil intentions started to become clear, your uncle sealed him in a parallel dimension. The CEO used this dimension to create Landflix, a system designed to decrease the cerebral capacity of the masses with its TV shows, and easily conquer the world. When Uncle Doc noticed something was up, he entered Landflix to try to stop the CEO himself, but mistakenly ended up becoming trapped. Now your only option (and the only way out) is to stop the evil CEO and get back all 6 batteries!